Have the players define respect. Discuss what it means to respect your coach. Players should respect their coaches, who sacrifice a lot to spend time coaching. And coaches also should respect their players, because it is a coach’s job to serve players by helping them learn and improve. 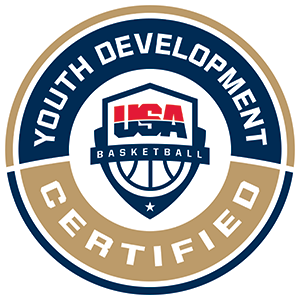 A big part of the mutual respect between coaches and players is listening to each other and getting to know each other so that there is a level of trust. All the players start on the baseline. When the coach says “GO!” all players will try to run to the other baseline. The coach starts at half court and tries to tag as many players as possible before they reach the opposite baseline. If a player is tagged by the coach, they will also be a tagger with the coach. Repeat the same process until all players have been tagged. Divide the players into four teams and assign them a corner. Each teams’ goal is to collect cones from other teams’ corners and place them in their own corner. Players are not allowed to protect their team’s corner. Coaches can tag players which means the player must return the cone they have from where they took it from. The game will end after 4 minutes and the team with the most cones wins. 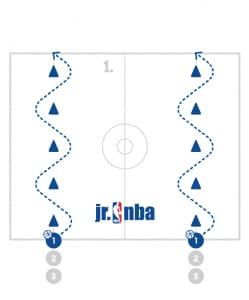 Make sure players dribble at all times and encourage them to go for the cones diagonal from them. Place 3 cones in a line close to a wall (about 8 feet away). Place a basketball on top of (or next to) the cone closest to the wall. Based on number of players, provide this setup again. Players will jump over the first two cones and land in front of the 3rd cone with a basketball on it. The player will then pick up the basketball and pass the ball at an imaginary target on the wall. They player will catch the ball when it bounces back and put the ball back on the cone and go to the back of the line. The next player will repeat the process and the group will continue by moving quickly. Make sure the players are balanced and jump quickly. Emphasize having the players hitting a target on the wall! Teach the players that it is important to “trace the ball” when they are playing defense. When the offense player has the ball and is not dribbling, the players can “trace the ball” by moving their hands wherever the ball goes. Tracing the ball applies pressure to the offensive player while providing an opportunity to get deflections or force bad passes. Group the players into 3’s and have one ball per group. Two players should stand a little more than the lane width apart and face each other, one with the ball. 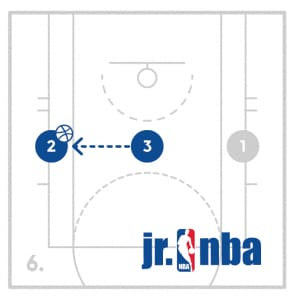 The third player will start in the middle and run to close out to the player with the ball and trace the ball. The player with the ball will wait 3 seconds before passing to their teammate. 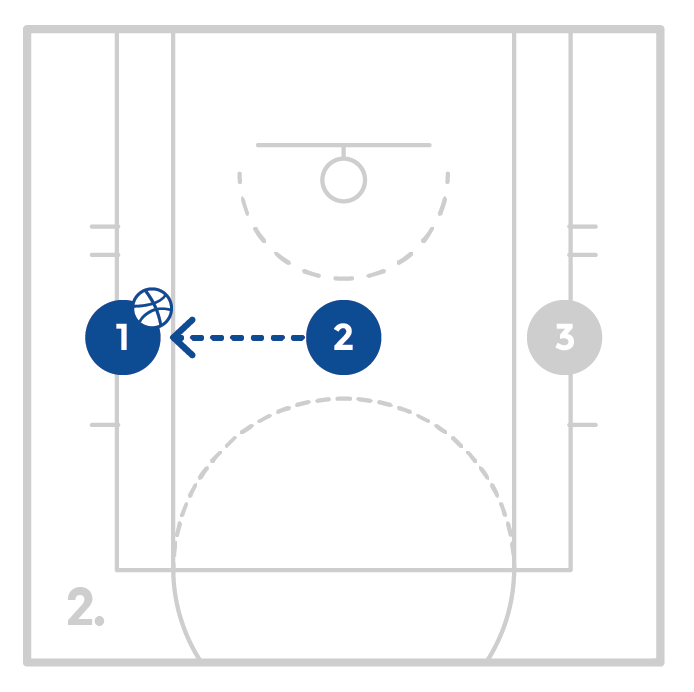 After passing, the player will follow their pass and close out and trace the ball with the player that received the pass. Continue this cycle insuring good close outs and tracing the ball. Try to keep the intensity up for this drill by encouraging the players to talk and trace the ball with active hands. Divide the players into 2 teams and have them line up on opposite baselines. 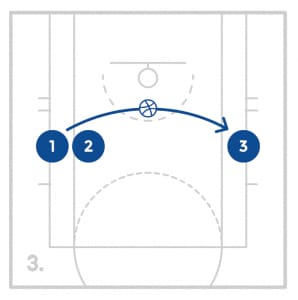 The coach will set up 3 cones about 2 or 3 feet apart on the opposite baseline from each teams’ line. Each team will have 2 balls. 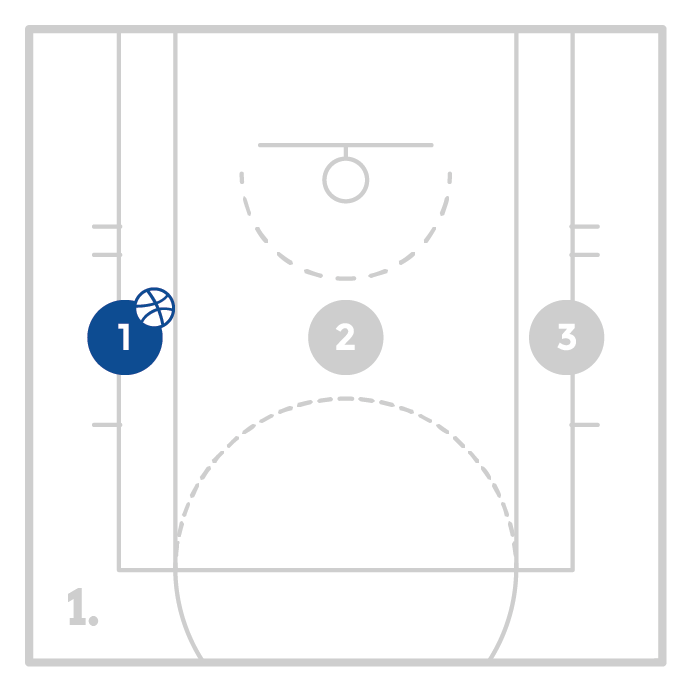 1 with the player in the front of the line and 1 off to the side. The first player will dribble to the opposite end of the court and shoot a lay-up. 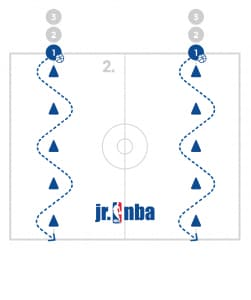 If the player misses the lay-up, they will go to the back of the line, but if the player makes the lay-up, they will go pick up the extra ball to the side and bowl/roll it towards the cones at the opposite end. If the player hits a cone, it counts as knocking it over and the coach will remove it. The team to hit all 3 of their cones first will win.